April 2000 of the British Magazine, Classic and Sports Car. 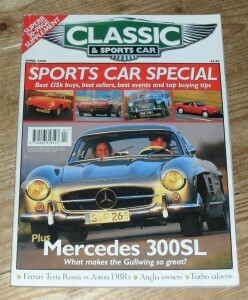 The cover feature of this issue is a sports car special. Other articles include items on the Mercedes 300 SL, Ferrari Testarossa vs Aston Martin DBR1, Ford Anglias, Turbo Saloons and many more.